My house on Henrietta Street has been desired on occasion as tottering and today I share the story of another tottering structure, the Broughton Suspension Bridge. The bridge was a 144 foot structure that spanned the River Irwell. It was paid for by the wealthy John Fitzgerald and was maintained by the funds raised from charging a toll to cross. On 12th April 1831, five years after the opening of the Broughton Suspension Bridge, the 60th Rifle Corps were returning to their Salford barracks after undertaking exercises on Kersal Moor. 74 of the men were crossing the bridge four abreast when the structure began to vibrate. Noticing that their marching made the bridge in time with their pace, the soldiers decided it would be something of a jape if they were to march harder and faster. The head of the group were approaching the end of the bridge when, with a great noise, one of the suspension supports tore loose and toppled towards the bridge. The unsupported position of the bridge plummeted almost twenty feet, hurling the soldiers into the water below. Luckily the water was no more than a couple of feet deep at that point and though twenty were injured and a few limbs were broken, all survived. In the aftermath it was discovered that the bridge construction had been unsatisfactory and that an engineer, Eaton Hodgkinson, had informed Fitzgerald of his own concerns about the structure three years before the accident. In fact the vibration created by the rhythmically marching soldiers had been the deciding factor that tipped the balance and caused the bridge to fall. The army issued orders that, in future, columns of troops should not march in step when traversing a suspension bridge. 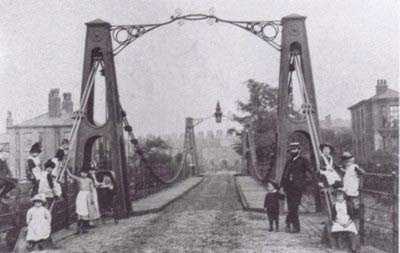 The Broughton Suspension Bridge was rebuilt and remained until 1924, when it was replaced by a new bridge that stands to this day. I have a strange interest in bridges so I especially enjoyed this. I lost a friend in the collapse of one of the freeway approaches to the Bay Bridge -- I think it was the Loma Prieta quake--a sister DDA from the Bay Area.. Considering my advanced acrophobia, its a wonder I like it, but to me, the Golden Gate is the most beautiful sight in my memory of life. What an awful thing to experience, I'm so sorry. I do know what you mean about the Golden Gate though, there is something about it that just inspires. Wow, this was definitely something I didn't know about. It just made me think of the I-35W bridge that collapsed here back in 2007. How people don't think any of these things will happen. It's one of those things that just makes me shudder to even think of it! I remember that, seeing it on the news swaying worryingly!